Jeff, Gretchen and Kyle take a closer look at the beasts so far in Legendary Pictures’ MonsterVerse! Hey, will you look at that? 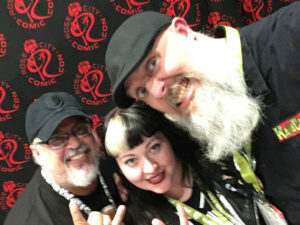 It’s another live Kaijucast panel episode! For this installment of the podcast, we’re reaching back into the archived recordings and to last year’s Expanding the Legendary MonsterVerse presentation at Rose City Comic Con. Jeff and Gretchen joined me on stage to discuss the monsters and mayhem in the films so far. For those who are counting, that really only includes Godzilla (2014) and Kong Skull Island (2017). However, as with many examples of modern storytelling, this lore is taking place across several platforms. In addition to the movies, there are comic books / graphic novels where more can be told and shown to the enthusiastic reader – titles like Godzilla Awakening and Skull Island: The Birth of Kong exist to dive deeper than just watching the films. Honestly, I’m a little surprised that video games haven’t been part of the platform…maybe previous encounters haven’t gone so well? Thanks to everyone who came out to see this panel – we’ll definitely be submitting some more programming to the 2018, so if there’s anything YOU’D like to see us talk about for this year’s convention, let us know! Yo, peoples! Don’t forget to head to the theater starting on the 23rd of this month to go see PACIFIC RIM UPRISING! And as long as you’re doing that, why not send in your homework for our discussion on this upcoming film? Make sure to send in your thoughts, questions and reviews before March 27th to be included in the episode!